E-mail this site to a friend ! 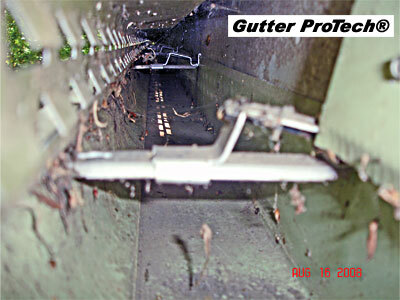 These Gutter ProTech® panels were installed on new K-style gutters in the fall of 1997 and this photo was taken in August of 2008. This gutter has been Self-Cleaning for over a decade; 11 full years and counting. "Yes homeowners, there really are Self-Cleaning gutters"! Complete and send a to see if a local contractor near you can turn your gutters into Self-Cleaning gutters with Gutter ProTech® . To see the trees over this gutter click on [Back] just below the photo. Note: small things caught in spider webs after 11 years / 44 seasons in the "real world" "Yes homeowner there really are Self-Cleaning gutters".